Lisa Collins focuses on the business of intellectual property and helps her clients protect their technology. Lisa leads the supervision of the firm's Patent Indemnification Recovery team where she has diverted and recovered in excess of nine figures. She regularly advises clients on IP strategy, licensing, privacy, trade secrets, and portfolio management, and handles numerous technology transactions. In addition, Lisa is a seasoned litigator who helps companies defend their products and intellectual property. Lisa has extensive litigation experience, and has tried several complex state and federal jury trials and specialized bench trials; has appeared as first and second chair before federal and state trial courts, administrative courts, and domestic and international arbitration panels; and has argued before the U.S. Court of Appeals for the Eleventh Circuit. Her litigation background, integrated with her transactional work in intellectual property, allows Lisa to have a deeper understanding of her clients' business needs and concerns and to bring value to their businesses. Lisa is consistently named as a Rising Star by Georgia Super Lawyers and has received awards for her leadership, legal acumen, and community outreach. She was a recipient of the Daily Report's 2015 "On the Rise" award, which names the top 40 Georgia lawyers under the age of 40 who are making a difference in the legal community and the community at large. In 2018, the National Bar Association awarded Lisa the 40 Under 40 Award and the Excellence in Leadership Award, which honors one member of the 40 Under 40 class for outstanding leadership. 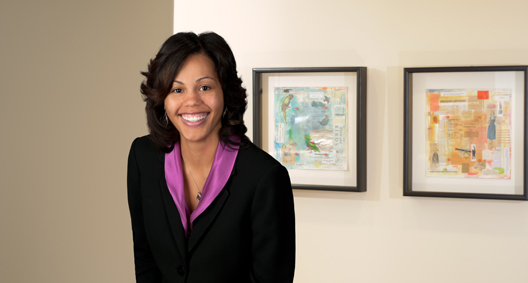 She was also awarded the 40 Under Forty Award by the Atlanta Business Chronicle for her commitment to the community and has been recognized in the Daily Report's Women Lawyers Edition. Lisa is very active in the Atlanta community and served on the Executive Board for the Georgia Association of Black Women Attorneys and as the longest serving chair of the organization’s signature fundraising event, the Glitter Gala. Additionally, she is President-Elect of the Georgetown Club of Metropolitan Atlanta. Represents telecommunication and cable corporations in the analysis and enforcement of indemnification rights in more than 150 complex patent infringement litigations and pre-litigation cases, resulting in substantial decreases in exposure and the diversion and recovery in excess of nine figures for her clients. Counsels telecommunication and cable corporations regarding best practices for supplier and technology agreements including issues associated with privacy, intellectual property, indemnification, and transparent formulae that maximize post-loss reimbursements for her clients. Represents software providers in the licensing or procurement of cloud technology. Represents a waste management company in IP strategy, technology transactions, and patent and trademark portfolio management. Working with a corporation as acting general counsel to provide IP strategy, technology transactional support, and to secure patent and trademark rights. Represents licensors and licensees in trademark, copyright and software license agreements. Successfully defended multiple clients against indemnification assertions. Defended numerous franchisees against trademark infringement and misappropriation claims. Defended and obtained a federal jury verdict for a turbine manufacturer in a bet-the-company action. Defended a national fraternity and a Georgia institution of higher learning against multiple hazing allegations. Obtained summary judgment and dismissal of all claims and affirmance on appeal. The Georgia Association of Black Women Attorneys Foundation, Inc. Through work with the Atlanta Volunteer Lawyers Foundation, assisted tenants in recovering damages to personal property from vermin infestation; drafted wills for elderly and disabled through the Wills on Wheels Initiative. Working with Atlanta veterans to assist them with benefit claims.